Happy New Year! Six days into January is perhaps a little late off the mark to be saying it, but this is my first post of 2014 and I’m excited to be back, so here’s to spreading well wishes all round. After a week of overindulgence – both in terms of family time and food – we decided to extend the suspended reality of the Christmas season with a little trip to Barcelona. The weather was beautiful, the food incredible and the happiness of our first trip for two as a proper married couple – rather than honeymoon newlyweds – unlimited. On New Year’s Day, we headed to the hills outside Barcelona, sat in the sunshine looking out over the city and talked resolutions. Big picture, exciting stuff like career opportunities, upgrading where we live and whether it might be time to think about extending our family of two. Alongside these big resolutions, there will be little things: smaller projects, plans and intentions that can be incorporated into our everyday lives. Carnivorous Husband wants to be able to walk on his hands (yes, really), there are yoga moves I’d like to master, household tasks and, of course, more food-based ideas than there will be days in the year. One intention is to try to post a few more savoury recipes. Sweet stuff is always popular with readers, often easier to photograph and less likely to go cold. It puts smiles on peoples’ faces, has a sense of occasion and is something I absolutely love to make. But of the 21 meals we eat each week, desserts and treats make up the minority, so it’s high time I shared a few more of my favourite savoury recipes too. Because old habits die hard, I’m easing into this resolution with a savoury-sweet recipe this week. Rich, sharp, pomegranate molasses works wonderfully in anything from breakfast through salads to main courses and desserts. Making it yourself might seem like a faff, but the result is so fresh and full of flavor and the ruby red juice so beautiful as it reduces, this recipe is absolutely worth it. Here’s hoping 2014 brings you everything you work for, everything you wish for and more. If you’d like to raise a toast, this molasses also tastes delicious in a champagne cocktail . . . There are numerous tips for de-seeding pomegranates around the internet, the best of which I’ve found being to break the fruit open, give each half a gentle squeeze then tap out the seeds using a wooden spoon. In this recipe, it doesn’t matter if a few seeds get squashed as they’re ending up as juice anyway, but try not to mix them up with the white pith which can make the molasses a little bitter. The honey is entirely optional: if your poms are heavy and ripe, you may well find them sweet enough already. 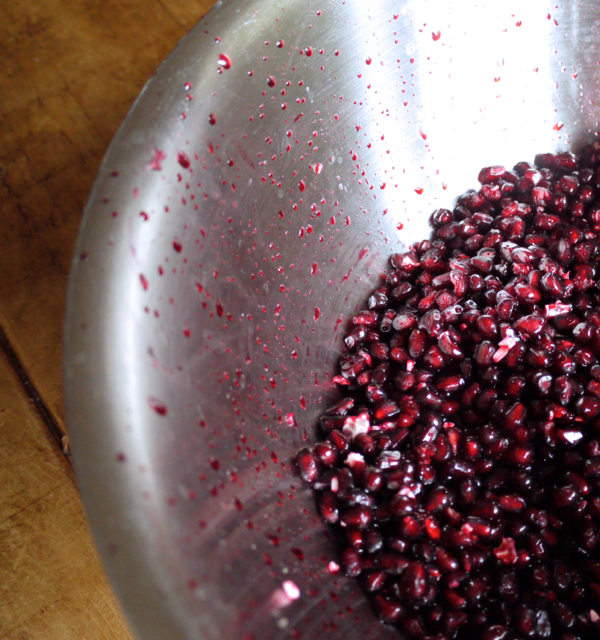 Preheat the oven to 180 degrees C. De-seed the pomegranates (see headnote) into a large bowl. Pick out any excess pith then give the seeds a really good squeeze to get as much juice out as possible. Press through a mesh sieve into another bowl, extracting as much juice as possible, then whisk in the lemon juice and honey (if using). Pour the liquid into a medium sized baking pan and bake in the centre of the oven until the liquid is reduced to a thick syrup, stirring occasionally, about 75 minutes. The consistency you’re looking for is a little looser than runny honey as the molasses will firm up slightly in the fridge. Remove pan from the oven and scrape the molasses into a sterilized container. Will keep in the fridge for at least one month. Toast sesame seeds with a little honey and sea salt. 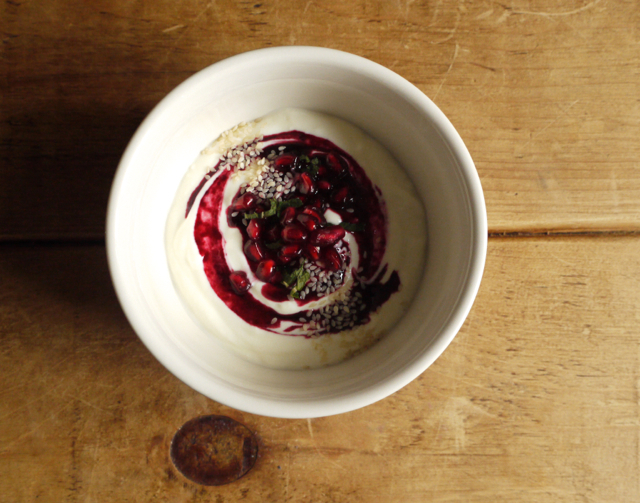 Swirl pomegranate molasses into a yoghurt (I like thick Greek or sheep’s milk). Mix pomegranate seeds with chopped mint then scatter over yoghurt along with the toasted sesame seeds. Roast aubergine halves with olive oil, paprika and salt. Mix cooked quinoa with chopped parsley, red onion, radishes, garlic and olive oil. Spoon into a bowl, add the roasted aubergine and top with a dollop of yoghurt. Sprinkle with pomegranate seeds and chopped mint then drizzle with pomegranate molasses. (Aubergine for breakfast? Why not? It works wonderfully with these flavours and makes a change from the usual oatmeal or eggs). Your photos are always so gorgeous! 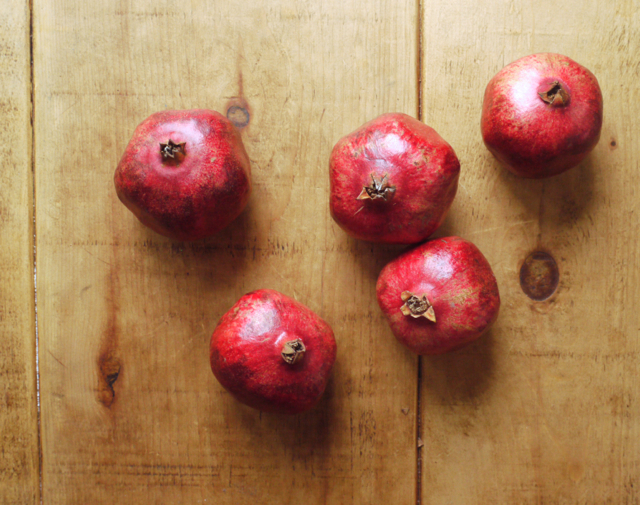 Keep reading about pomegranate molasses – v on trend. Lovely looking recipes. Thank you! If you’ve not tried pomegranate molasses, you must, it’s so delicious. If you don’t have time to make your own, I like the Arabica brand. I’ll have a bowl of that yoghurt thanks -welcome back! 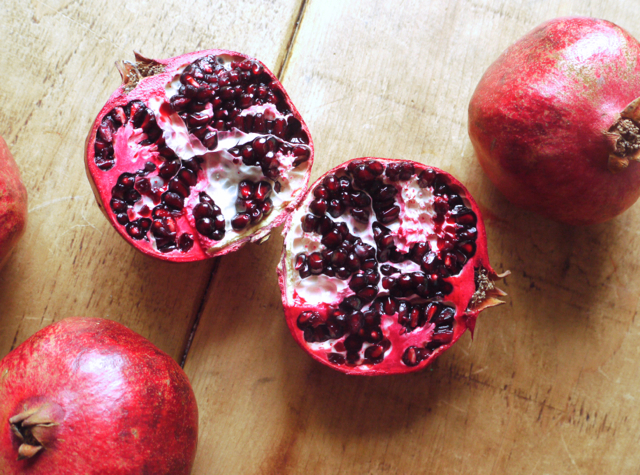 Gorgeous pics and you’ve reminded me that I’ve been meaning to make pomegranate molasses myself. The shop bought stuff is very sweet. I think it naturally is pretty sweet from all those reduced sweet seeds, but you’re right, homemade is a little more tart and natural tasting. I’m loving pomegranate molasses at the moment. Your two breakfast ideas are beautiful although I’m not sure I could do eggplant for breakfast. “more food-based ideas than there will be days in the year” – I hear you! Looking forward to a fun- and ideas-filled 2014. Woo for featuring more savory recipes! I’ve been waiting for this day. 😉 Can’t wait to see more. Thanks Amy! I think my husband is worried I’m going to start stealing away his dinner to photograph but have promised I won’t let it affect what we eat (and the temperature we eat it at!). I love this! I’ve been finding pomegranate molasses difficult to source, it never occurred to to make my it myself. I will be making this, thank you! Glad to be of help! If you do need to buy it, I really like Arabica’s version with no added sugar too. Your trip to Barcelona sounds fabulous! Love the aubergine recipe idea – similar to an Ottolenghi one that I make all the time and is just delicious. I’ve never thought of making my own pomegranate molasses but that’s a great idea for when pomegranates are everywhere and cheap, like now – I imagine the homemade version is probably fresher and nicer for breakfast than the very dark, sharp stuff from a bottle. Barcelona was AMAZING. If you ever need any restaurant recommendations, I have a few firm favourites 🙂 This is definitely only worth doing when pomegranates are cheap and ripe and full of juicy seeds. I love the photos of the pomegranates! I haven’t tried pomegranate in savoury dishes yet. I will have to do it! What a great way to use such a delicious ingredient! Pomegranate molasses are simply wonderful. Your photos are lovely, and I like the easing into savory recipes–why not eggplant for breakfast? I’ll keep this in mind for when I’ll have eggplant in the farm share, though sadly the pomegranates will be long gone. I wonder if I can freeze the arils and make it in the summer? Must investigate. The difficulty I have in photographing savory food, temperature and all aside, is that brown food is just very . . . . brown. Oh my, I have never thought to make my own pomegranate molasses. It’s so easy! Of course it is! The jarred variety I get isn’t 100% tasty, so now I know why. Thanks for the inspiration! Golly – this looks divine. Can not wait to see what else you dish up! Pomegranate molasses sounds very interesting, can’t wait to try.Thanks! Brilliant! We ate this all the time growing up in a Middle Eastern home – I just love it and as you said, it can be used in so many ways. Fabulous you’re making it at home yourself. Thanks Kathryn! Should probably do a Barcelona restaurant round up at some point, we ate in so many yummy places! Ah, so pleased you like the blog! Barcelona was just wonderful, wish I was back there now 🙂 Happy new year! Delish! This land where sweet and savory meet, is where I like to live. I love that you make your pom molasses in the oven – brilliant! I’ve always gone stove top and the timing is tricky. Wishing you and your husband a fantastic 2014. I love hearing all of the hope and possibility of newlyweds – makes me smile!! This looks divine! I’m a big fan of pom molasses, but have never tried making my own. I’ll definite be having a go! Pomegranate molasses is definitely one of my favorite condiments, yet I’ve never made it myself. And I am definitely a fan of savory breakfasts—in fact, I prefer them to sweet ones. Your eggplant dish is right up my alley. 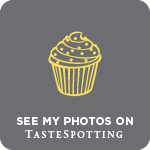 Beautiful photos and that shot of molasses with the yogurt looks amazing and delicious! What a wonderful recipe – it never occurred to me to make my own pomegranate molasses (maybe the price of pomegranates put me off?). A pity really, my boyfriend’s mum has a tree in her garden which has given us a steady supply of deliciously ripe fruits over the last few weeks, wish I had saved a few to make this! As much as I happily buy pomegranate molasses, I do find the sweetness and acidity really vary from brand to brand which is annoying when you cannot get your hands on your favourite brand. I would love to hear your Barcelona recommendations as well – although I have been a feww times, my last trip was a couple of years ago and it would be good to update my list of places to go and eat! All the best for 2014 – I certainly cannot wait to see what delicious recipes you will share with us over the coming year! Yes, it’s definitely only worth making if you can find good quality, cheap poms that are full of fruit. Thank you! Shall add those to my Barcelona list! Happy New Year to you too! I love pomegranate molasses… have made it at home a few times and always have a bottle in the kitchen. Great, great ingredient… I couldn’t agree more. What a beautiful way to ease into the year ;D Happy New Year to you as well! Barcelona sounds like a fantastic way to see in the new year! these photos are gorgeous! Oh fabulous! I love pomegranate molasses and go through bottles of the stuff here in Doha. Never made my own though. I want to, but then I get them so easily! Laziness I tell you. You however, seem happy and fired up for the year ahead! Happy New Year! 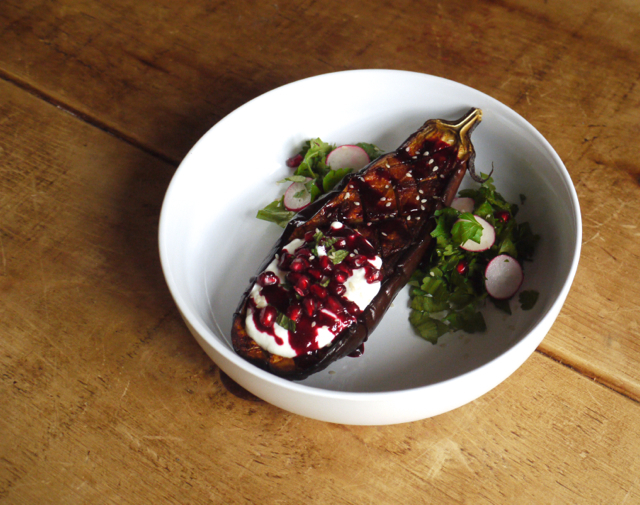 PS: Have you tried Ottelenghi’s Zaatar and Pom Molasses Roasted Aubergines…slobber. Yes, Ottolenghi’s recipes are what got me into pom molasses in the first place…yum! I never thought making pomegranate molasses would be so easy! Loved the photos and this looks worth a try. Also, I know what you mean about less sweets, I feel the same about my own endeavor. 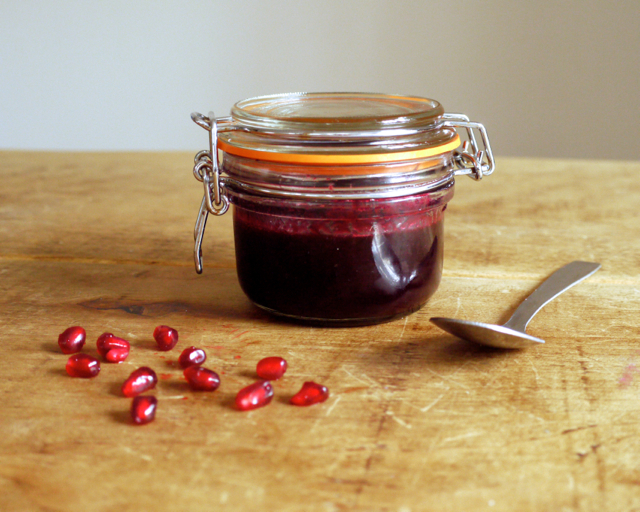 Lovely recipe, I’d never think to make pomegranate molasses. My blog has the opposite problem, too many savoury recipes, not enough sweet ones. I don’t have an oven. Any reason why I can’t do this on the top of the cooker? Yes, you absolutely can make it on the stove top. I think the oven method gives it a slightly better flavour, but as long as you just simmer on the stove top and don’t boil it should be good. Let me know how you get on!